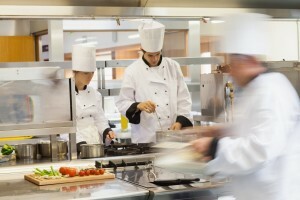 Why Rent Chef Coats and Pants or Aprons? Why rent chef coats? To keep your kitchen employees cooking! Anyone who’s worked in a kitchen can tell you it’s a messy place. While cleanliness is vital in a working kitchen, working with messy ingredients in a high paced and high-stress environment can quickly lead to stains on a chef’s clothing. After a long day of meticulously preparing meal after meal, sometimes till late into the night, the last thing a chef wants to do is worry about getting out all types of stains in their uniforms before the next busy shift. As a business owner, it’s important to recognize an opportunity to make your employees’ lives easier, while also saving money and ensuring the positive image of your company. That opportunity? Renting chef coats and pants, aprons, and kitchen shirts and pants. Kitchens are high stress areas as it is. Between stocking, prepping, cooking and cleaning the kitchen, it’s a tiring job. Kitchen managers and restaurant owners can go a long way towards keeping their kitchen happy by supplying them with clean uniforms they don’t have to worry about laundering themselves. You might be thinking, “If my kitchen staff isn’t going to clean their uniforms I’ll have to invest in expensive laundering equipment that will get a ton of use and eventually break, then I’ll have to pay to have it fix.” This can be a daunting expense for any restaurant, especially one looking to keep overheads low. The answer is to rent your uniforms. Your employees will have fresh, clean uniforms and you won’t have to invest in expensive equipment to keep them clean since the rental company takes care of the cleaning. This entry was posted on Friday, February 10th, 2017	at 12:09 pm	. You can follow any responses to this entry through the RSS 2.0	feed. Both comments and pings are currently closed.